Best-selling author Vince Flynn is known for political thriller of the character of Mitch Rapp. While his earlier career is a bit unorthodox (working for Kraft foods, a brief stint in training to be an aviator in the US Marine Corp, and then as a bartender), his passion came from reading and writing and, overcome his dyslexia, was able to self-publish his first novel titled Term Limits in 1997; a novel that was set in his forthcoming Mitch Rapp series (i.e. the same universe), but a part of that particular series. After that, Flynn began to write a political thriller series, starting with the book Transfers of Power in 1999. The series followed the exploits of fictional character Mitch Rapp, an undercover CIA counter-terrorism agent whose primary objective is thwarting terrorist attacks on the United States and portrayed with having an aggressive stance (aka no non-sense) attitude as he takes measures that are more extreme than many might consider commonly acceptable. The series, dubbed the “Mitch Rapp” series was generally favored by readers, with Flynn’s growing popularity grown with each new book, which, as of 2017, has sixteen novels within the series. Unfortunately, in 2011, Flynn announced (via a fan newsletter) that he was being treated for advance Stage III prostate cancer, which (sadly), he succumbed to, passing away in June of 2013. Despite his death, Flynn’s legacy of his beloved Mitch Rapp continued onward, with several authors co-writing his unwritten manuscripts and publish new novels, with the newest one titled Enemy of the State being released in September of 2017. Now, expanding Flynn’s iconic character to the big screen, Lionsgate, CBS Films, and director Michael Cuesta present the movie American Assassin, which is based on Flynn’s first Mitch Rapp novel. Does this finding its footing (and its target) or does it only shoot blanks and fail the mission? Tragedy strikes Mitch Rapp (Dylan O’Brien) on the day of his engagement to his girlfriend in Ibiza, Span, watching helplessly as a group of Islamic terrorists storm their resort, murdering and gunning down of the most guest there, including his fiancée. Haunted by those memories and allowing his rage to boil, Mitch works to infiltrate the terror cells as a rogue individual, coming close to exacting his revenge when CIA Deputy Director Irene Kennedy (Sanaa Lathan) decides to intervene, urging the unhinge killer to consider her black ops unit, Orion, joining an elite group of assassins under the watchful eye of ex-military man, Stan Hurley (Michael Keaton). Teeming with cockiness and his bravado attitude, Mitch’s eyes are suddenly opened to the world of counter-terrorism and, under Stan’s aggressive tutelage, trains to become a lethal weapon for his country, while remaining driven to murder those responsible for what was taken from him. 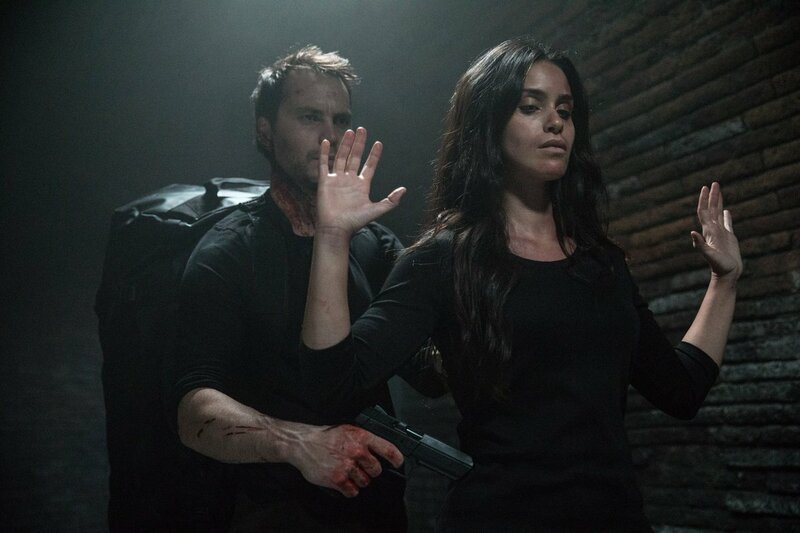 When materials for a nuclear weapon end up on the black market, Mitch is sent in to investigate, joined by Iranian-born operative Annika (Shiva Negar) with Stan Hurley as their point man to find the name called Ghost (Taylor Kitsch), Stan’s ruthless protégé and a man trying to encourage a Middle-Eastern conflict with the United States. Working in a bookstore for many years, I’ve come across author Vince Flynn many times, offering it as a recommendation for readers who like similar works from authors such as Lee Child, Brad Thor, and Tom Clancy novels. Personally, I’ve only read two of his books (2008’s release Extreme Measures and 2009’s release Pursuit of Honor) and found both entries quite fun and interesting as I do plan to return to the Mitch Rapp series sometime in the near future. Also, if you didn’t know this, Vince Flynn served as a story consultant for the fifth season of the TV series 24, which followed the character of Jack Bauer (a character that was similar to Flynn’s Rapp). Personally, I liked season 5 of 24 the best and maybe that’s why. Working within books and becoming more familiar with the endless list of author and literary novels, I remember when Vince Flynn passed away (and was a bit saddened because that meant his Mitch Rapp series would end). Thankfully, Mitch Rapp lived on in the literary world, with co-authors writing to continue Flynn’s no-nonsense character of Mitch Rapp for several years now (much like what happened with Robert Ludlum’s character of Jason Bourne). So, with Flynn’s iconic character enduring with the book world after the author’s death, Hollywood assumed that it was time for Mitch Rapp to be brought to the big screen, especially after adapting several Tom Clancy novels over the years (Sum of All Fears, Patriot Games, Act of Valor, etc.) as well as two works of Lee’s Child Jack Reacher stories (Jack Reacher and Jack Reacher: Never Go Back). I really don’t remember hearing that much about American Assassin (via the internet buzz), but I do remember seeing the trailers when I went to the movies, finding it to be somewhat intriguing. However, I did not make the connection between American Assassin and Vince Flynn’s novel for some time (I know…I was bit of blockhead for not making that connection). So, while American Assassin wasn’t on my “must-see” movies” during the month of September, I decided to go to the movies and see what if Mitch Rapp’s first cinematic journey was good. What did I think of it? Well, it’s kind of a mixed bag as I found American Assassin, despite a strong supporting performance from Michael Keaton, to be a predictable and derivate of action spy thrillers. Basically, there was nothing really nothing to rave about this movie, which isn’t a good thing. American Assassin is directed by Michael Cuesta, whose previous directed such films like L.I.E., Roadie, and Kill the Messenger. Additionally, Cuesta was also serves as the executive producers and directed several episodes for the first two season for the Showtime TV show Homeland (the first two seasons are the best the show has to offer). With that in mind, Cuesta takes that Homeland-ish approach (i.e. modern terrorism and some geo-political issues) when directing American Assassin; crafting the feature to be an action / spy thriller. Additionally, since not many moviegoers know of Flynn’s Mitch Rapp character, Cuesta (and the studio heads who greenlit this project) smartly decide to adapt Flynn’s American Assassin book, which was released in 2010 and is the first chronological installment in the series; setting up the film to be an origin tale of sorts by introducing a younger Mitch Rapp rather than choosing one of the latter installments to adapt. Cuesta also makes American Assassin feel like a gritty modern-edge action / spy film, utilizing the movie’s R-rated rating as theatrical license to make the feature gritty with several bone-crushing staged action sequences that are similar to other black ops agent motion pictures. This is made quickly apparent by the film’s opening scene, which shows a effective (but brutal) terrorist attack that Rapp is in the middle and watching helplessly as his girlfriend is gunned down. In terms of craftsmanship and filmmaking, American Assassin provides a well-worked and solid presentation of capturing several action sequences, including a handful of hand-to-hand fights as well as car chases and foot-chases. Additionally, while the narrative of a globe-trotting black ops story unfolds, the movie also sees several impressive visual moments from either unique architecture designs and / or layouts and striking scenery of a European landscape and setting. Thus, despite what I make this of the film overall, I must commend the American Assassin’s film editor Conrad Buff IV and cinematographer Enrique Chediak for their work on the project. Lastly, the movie’s score, which is compose by Steven Price, is a fairly good one by adding some dramatic musical tension for some of the film’s bigger moments as well as softer melodies for its quieter ones. Unfortunately, despite being a adaptation of a bestselling book of a bestselling series, American Assassin doesn’t quite feel like “bestselling” material, with several large (and glaring) problems that are riddled in and out of the feature. While I stated that Cuesta worked on Homeland, a television series that is known for its examination of social / political subject matters as well as in-depth characterizations of morally conflicted protagonists, American Assassin chooses to keep its focus on close-quarter action thrills a lined narrative momentum rather than an insightful thematic storytelling arc (and its thought-provoking messages) and rich characterization development. The film’s screenplay, which is credit to Michael Finch, Stephen Schiff, Marshall Hershkovitz, and Edward Zwick, is also another problem that American Assassin stumbles throughout, finding the movie’s screenplay too “by-the-numbers” and almost derivate from other action / spy thrillers features that have come before. Thus, this means that the film can’t really stand on its own merits and falls back on the knowledge and usage of other past endeavor to carry the movie’s lackadaisical work. While I haven’t read Flynn’s American Assassin, I can probably assume that’s it far more interesting and in-depth (in both story and characterization) than what’s presented in the film. Because of this, the movie’s narrative, for the most part, feels bland and formulaic. Even the story’s plot twist and turns are easy to spot. While the movie’s runtime is somewhat lean (roughly one hour and fifty-one minutes long), American Assassin doesn’t get bogged down in unnecessary sub-plot / side-story drama, but does takeaway time to develop its characters into well-rounded ones (more on that below). Even the movie’s third act, while staged properly and intentions are known, feels lackluster and does get a bit of ridiculous (if you watched it…you know what I mean). All in all, American Assassin just feels like a very vanilla action spy / thriller with some fairly good action set-pieces and sequences, but nothing truly gripping and / or memorable or even that much entertaining. Basically, think of American Assassin to be similar to Kenneth Branagh’s 2014 Jack Ryan: Shadow Recruit (a feature film that was to setup a new franchise, but was just a “one and done” motion picture). The cast in American Assassin has some recognizable faces, especially those actors who playing characters in the film’s lead roles, but, with the exception of one, fail to impress. All are good actors and have several credible works underneath their belt…. it’s just not in their American Assassin movie characters. Playing the role of the film’s protagonist character of Mitch Rapp is youthful actor Dylan O’Brien. Known for his roles in The Maze Runner movies, The Internship, and the TV show Teen Wolf, O’Brien does a fairly good job in the role of a younger version of Flynn’s famous black ops creation. However (and maybe this is just me), I felt that O’Brien doesn’t look the part of an action / spy character and doesn’t have that “mature” look on how I pictured a younger Mitch Rapp. Granted, I know this is the first story of Rapp, so he has to be a young and arrogant adult, who eventually gets molded into a no-nonsense killing machine, but O’Brien doesn’t fit the particular role well-enough; looking more like actor fit for a YA adaptation (like his appearance in The Maze Runner movies). Additionally, beyond O’Brien playing Rapp, the character in the movie isn’t that really well-rounded, with (again) the screenplay writers following a formula of making the film’s protagonist feel like thinly-sketched individual who travels down a very “well-trodden” path that similar action-spy / black ops heroes have gone down many times. Thus, this combination of the two makes American Assassin’s Mitch Rapp bland and not that interesting. Perhaps the best performance of the entire film comes in the form of Rapp’s teacher / mentor figure, Stan Hurley, who is played by actor Michael Keaton. While the character isn’t that all complexed or original, Keaton, known for his roles in Batman, The Founder, and Birdman Or (The Unexpected Virtue of Ignorance, seems to be having run in the role, bringing a since of gravitas screen presence to the character of Stan Hurley, a character that’s battle-hardened and tough as nails; a role that Keaton is perfect for. It may not be his most dramatic performance (probably won’t be nominated on any of the upcoming award shows), but Keaton’s Stan Hurley is indeed the “scene stealer” in American Assassin as well as being the most entertaining and memorable one of the entire cast. As for the film’s antagonist character, actor Taylor Kitsch plays that role of Ghost (aka Ronnie), one of Hurley’s ex-protégés that has now gone rogue. Kitsch, known for his roles in Battleship, Lone Survivor, and John Carter, definitely looks the part of a “bad guy” (who was once a good black ops operative) and his acting is fine in this particular movie, but his character of “Ghost” isn’t that memorable. In truth, the machinations on why he’s doing what he’s doing is simply glossed over and just seems half-baked. Thus, of three main leads (O’Brien, Keaton, and himself), Kitsch’s Ghost is probably the weakest and just comes off as a shallow, if not cliched, villain of the spy thriller genre. The rest of the supporting cast, including Sanaa Lathan (Blade and Now You See Me 2) as CIA Director Irene Kennedy, Shiva Negar (The Art of More and My Babysitter’s a Vampire) as Iranian operative agent Annika, and Scott Adkins (Legend of Hercules and Doctor Strange) as black ops agent Viktor, have their moments throughout the movie, but don’t go beyond anything in-depth and are only present (on-screen) to drive the narrative forward rather than their respective character growth of motivation / development. Mitch Rapp trains to become a deadly assassin to stop a rogue agent (and to settle his own personal demons) in the movie American Assassin. Director Michael Cuesta newest film brings to life the popular literary black ops character of Mitch Rapp to the bring screen as an origin story film. However, beyond a couple of set-pieces and action sequences as well as Keaton’s solid performance, the movie never raises to occasion, feeling predictable and formulaic with its cookie cutter characters, thinly sketched narrative, and bland storytelling. To me, this movie was pretty “meh”. It had the makings of a great action-spy thriller, but the film just merely “coasted” throughout most of its runtime, producing very little memorable moments of entertainment. Fans of Flynn’s books and / or black ops films might give this movie a glance (just not immediately), but, with that being said, my recommendation for this movie is a skip it as (like I said) there’s really not much this movie has to offer from what’s been told before. 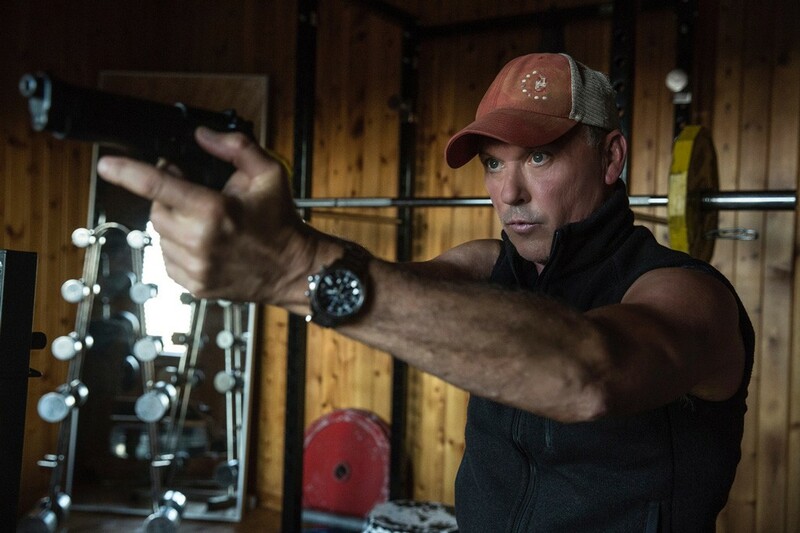 In short, while Vince Flynn’s character creation of Mitch Rapp lives on in the heart and minds of the literary world (within Flynn’s novels), American Assassin, the cinematic representation of the titular character, seems like a forgettable and one-off installment rather than the start of a franchise feature film series. Most of the reviews for this one really don’t praise this one. A real shame as I was really looking forward to this one: the trailers looked pretty cool. Well, I will watch this one when it gets released on dvd, but am not in a real rush to see this one now. I knew this wouldn’t be any good. The trailer looked so generic and predictable. Great, in depth review as always. I think I’ll probably give this one a miss. Haha…yeah, this movie isn’t something for people to “rush” to see at the movies. Best to wait for it when it comes to TV (sometimes next year). Thanks for commenting!! !